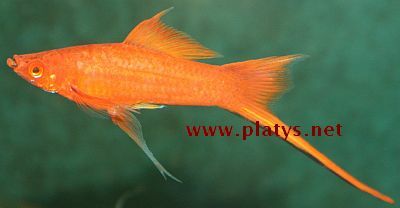 Two years ago I started to work with lyretail helleri-swordtails with normal gonopodium. There are always turning up some of those in the lyrepopulation. This calls for some interesting breeding activities. 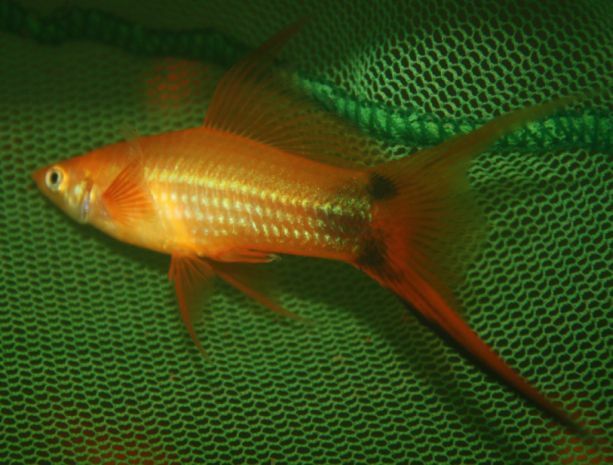 In this case we have a fin shape, that I gave the name "Lyretail swordtail with normal gonopodium", and which I bred for a long time. Others name this breed "half lyre". Nowdays I have begun to call them "King lyretail" because of the shape of the dorsal fin. When you cross King lyre-males with a helleri-female with normal fins, you get females and males with normal fins as well as males with the fin form King lyretail. This has happened for at least two more breeders besides myself. This is letting me arrive at the assumption, that this form breeds in the same way as the normal male. When you cross the phenotype lyretail with the King lyretail, you will be seeing three different fin forms as a result: Lyrefins from both sexes, King lyre only as males and finally individuals with normal fins from both sexes. These traits have been observed, though the exact procentage has not been calculated, because all lyre females and their offspring were not tested. Batches like this are indeed to be seen in my tanks and the tanks of other breeders. The King lyres have uneven length in their swords, partially they are equipped with only a stub of an upper-sword, which should be interpreted as a not yet considered breeding objective, and a considerable dorsal fin - a delta (in the original sense) with an edge pointing backwards. This type also has prolonged breast fins as well as - a normal gonopodium. The lines I observed possessed normal fins, whereas the females related around King lyre-lines, to some extent had a considerable bottom-sword. To this circumstance there is a quote from a breeder, who claims the females if impregnated with King lyre-males, will loose their uppersword at about the 5th generation. Those females will instead show a bottom-sword. This on the other hand could be an indication of, that these particular females could be King lyretail-females. To this date I do not have the information yet, as to if this is regarding crosses with females of lyre- or normal fin shape. From the same source I recieved the information, that females with bottom-swords continue to give offspring with King lyre. Also Günther Schramm has made the same observation. This would support the assumption, these females would be King lyretails. To fully confirm this, it would be nessesary to count the crossings and also to check the offspring of the resulting females. Well, lets se how that turns out. I now have a normal lyretail-female, impregnated by a King lyre-male. This female comes from a cross from King lyres. I am attempting to let ALL female offspring of this testcrossing have batches in order to examine them. Only this way, the genetics of the King lyre can become clear. The reader might wonder about this method of considering possibilities. I do not wish that something becomes permanented, which later on will prove to be wrong. I do not aim to become "the big inventor of all" but to arrive to knowledge myself, and that I do not intend to blur with any quick assumptions of any kind.